District Heating Market Size « Global Market Insights, Inc.
Touted as offering one of the most reliable and eco-friendly heat delivery methods, the district heating market allows the flexibility to tap into multiple sources for generating heat, including renewable energy, and supply it to residences as well as commercial spaces. Government mandates across all the regions are indicative of the efforts to reduce the use of energy sources which emanate high ratios of green house gases and adopt alternatives with low CO2 emissions. The district heating industry segment has evolved to supply heating that is more efficient as compared to traditional systems and more pocket-friendly than having individual boilers. 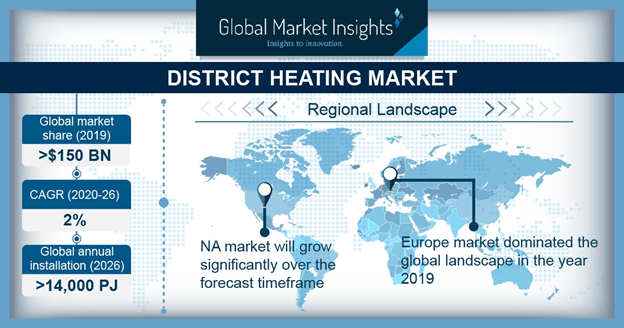 Further, the worldwide upsurge in energy demand alongside the massive urbanization and industrial development being observed will stimulate the expansion of district heating market. With the potential to achieve considerable reduction in energy wastage and bills for consumers, the district heating market reached an estimated valuation of over USD 180 billion in 2017. The facility to incorporate diverse energy sources into a centralized heat generation and distribution network has presented vast opportunities for governments to decarbonize heat sources in the long run. Such a network can be supplied with surplus energy from power plants, industrial processes, waste management facilities, geothermal sources and gas-based or biogas fueled CHP units. Consequently, a large quantity of valuable energy will not be lost without cause and can be used to generate heat for utilization in homes and businesses. Even unused energy obtained from sustainable sources like wind or solar installations can now be routed to a district heating facility. In addition, not being dependent on a solitary heat source will ensure substantial reliability and service continuity, a key factor in the impulsion of the district heating market. To outline the present scenario of the district heating industry, U.K. is a prominent region having a magnitude of facilities set up to supply cost-effective, environment-friendly and quick heating services. As per records, there are more than 17,000 heat networks in the U.K., with approx. 91% located in England and 6% in Scotland. Governments in the U.K. are ramping up efforts to encourage the district heating market, with a latest example being the Glenrothes Energy Network in the Glenrothes town of Scotland. Providing further details regarding the Glenrothes Energy Network project, it is a GBP 24 million (USD 31.72 million) community heating scheme being developed with the collaboration of Fife council, RWE and the Scottish government. The Fife Council had revealed its target to reduce carbon emissions by 42% by 2020, and the new heat network will help in attaining that mark. The energy center will be using heat sourced from RWE’s biomass CHP plant in Markinch, for supplying low-carbon heating to commercial establishments and households in the area. It is slated to lower utility bills, avoid fuel poverty and contribute towards climate change. The plant is fueled by wood waste and generates up to 53MW electricity along with heat. The Glenrothes Energy Network represents the lucrative prospects of CHP based district heating market, which is expected to grow with a rate of over 4% over 2018-2024. Moving to the district heating industry in Europe, Denmark is a leading contributor to renewable energy development and district heating processes. The country had introduced the Heating Supply Act under which substitution of traditional heating systems with new district heating systems was made obligatory for upcoming buildings. It was reported that over 63% residential population used district heating in 2017. Elaborating Denmark’s accomplishments in the field, the Smørum Kraftvarme power plant in Smørum gave a contract to Aalborg CSP in 2017, to build an 8MW solar field spanning an area of 11,312m2 and capable of producing 5,568MWh of heat annually. The solar plant will undercut carbon emissions by at least 1,100 tons per year and give a significant boost to the district heating capabilities of Denmark, which already has multiple heat networks across its kingdom. Several government aided schemes to propagate the importance of a centralized heating system in other parts of Europe are certain to bolster the Europe district heating market share in the coming years. To summarize, the characteristics that give the district heating industry a distinctive advantage are economies of scale, harness of waste energy, low cost operations and the capacity to reach a large number of consumers. The competitive landscape of the district heating market consists of eminent players like RWE AG, Fortum, NRG Energy, Dong energy, Hafslund, among others that offer comprehensive heating solutions for communities and businesses. This entry was posted in ENERGY, MINING, OIL AND GAS and tagged District Heating, District Heating and cooling, District Heating Market, District Heating Market Analysis, District Heating Market growth, District Heating Market Outlook, District Heating Market Price, District Heating Market Report, District Heating Market Share, District Heating Market Size, District Heating Market Trends, District Heating Network, District Heating Pipe, District Heating System, District Heating UK, Energy market.